Most of the fuchsias grown as garden or house plants are hybrids (Fuchsia hybrida, hardy to U.S. Department of Agriculture plant hardiness zones 8 through 10), resulting from crosses between species of fuchsia native to South America. About 100 species and between 3,000 and 5,000 cultivars exist. 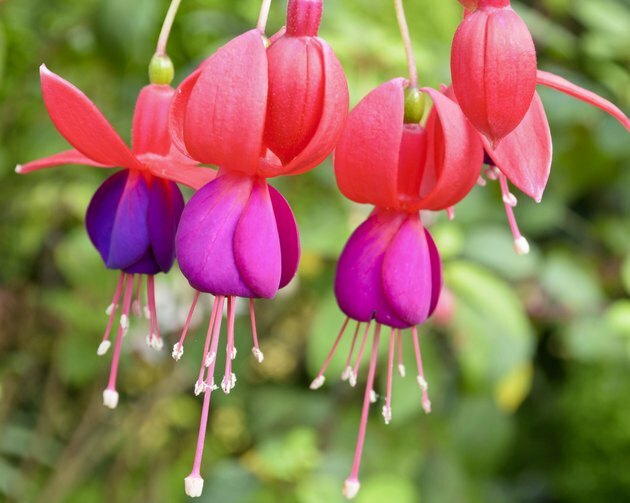 Fuchsia flowers are pendulous and bell-shaped, with a central cup of petals framed by flaring, backward-curving, petal-like sepals, often in a contrasting color. Pollinated by hummingbirds, fuchsia's stamens and pistil extend beyond the flower. Moist but not soggy soils suit garden fuchsias. Guard against too-wet soil by providing well-draining soil in gardens, and using an open, organic-rich potting mix containing perlite or vermiculite in containers. In hot weather, you may have to water container plants once or twice a day. If the container plant has a saucer beneath it, empty the water it collects soon after watering the plant. For garden fuchsias in cool summer areas, water in the morning to avoid fungal disease and water about once a week in the summer. In the fall, slowly reduce watering so the plant slows growth before its winter rest period. During flower production, fertilize fuchsias every two to four weeks with a complete water-soluble fertilizer such as 20-20-20. For landscaping plants, mix 1 tablespoon of fertilizer in 1 gallon of water. Mix it well and soak the rooting zone of the plant. For container plants, mix 1/2 teaspoon of fertilizer with 2 quarts of water and water until the solution comes out the drainage holes. Fuchsias prefer cool summer temperatures between 60 and 75 degrees Fahrenheit. Where summer temperatures get over 80 to 85 degrees F., fuchsias decline. In these areas you can treat potted fuchsias as annuals. Avoid heat by keeping plants indoors in a west- or east-facing window or on a shaded porch or patio from early summer to fall. For frost protection, bring container plants inside before the first predicted frost and don't move them outdoors until the last frost is over. For landscape plants, choose cold-hardy species or cultivars and don't prune them before winter, because the stems help insulate the rest of the plant. In areas with cool summers, fuchsias can grow in full sun or partial shade. In hotter areas, they need partial shade. Pruning depends on the growth form of the cultivar. For hanging basket plants, pinch off the stem tips regularly to encourage branching and to keep the plant bushy. Use your fingertips or pruning shears cleaned with a rag soaked in alcohol to prevent disease spread. Remove the tip and the first set of leaves. For bush fuchsias, pinch off the growing tip of the young plant's main stem so sideshoots form; pinch sideshoots back to develop bushiness. For container plants kept over the winter, prune in late winter or early spring. Cut the branches back to about where growth began the previous season, leaving two or three leaf buds per branch. If fruits form, remove them unless you want to harvest seeds. Container plants grown outdoors or landscaping plants are relatively problem-free. Greenhouse or indoor fuchsias may become infested with whiteflies, aphids or mealybugs. Dislodge pests with a strong stream of water or remove them with a cotton swab soaked in rubbing alcohol. Fuchsia gall mites are microscopic pests and may cause galling and distorted growth at shoot tips. Remove and destroy the infected branches or destroy the plants and grow mite-resistant cultivars. Fuchsia rust is a fungus that can cause brown spots on leaf undersides; remove and destroy the infected leaves.